This journey starts in Lima, or the “Ciudad de los Reyes.” The rich and vibrant colonial heritage here gives you a great introduction to all that Peru has to offer. You then follow the traces of the Inca civilization starting in Cusco. The exploration continues through the Sacred Valley where you explore the main Incan sites such as the Pisac archaeological complex, the artisan market in the downtown Plaza, and the well-preserved site of Ollantaytambo. You culminate your visit to Peru with the center of the Incan Empire: Machu Picchu. After Peru, you head south to the extraordinary Salar de Uyuni, located amid the Andes in southwest Bolivia. This is the world’s largest salt flat - a desert-like, 11,000 km landscape of bright, white salt and rock formations surrounded by cacti-studded islands. Its otherworldly expanse can be observed from Incahuasi Island. Though wildlife is rare in this unique ecosystem, it does harbour many Chilean pink flamingos! Cusco is located at 11,300 feet. Once you arrive in Cusco you have the day free to explore so you can acclimate to the altitude. The numerous cafes, markets (the San Pedro Market is a must) and stores are sure to keep you busy! We suggest visiting The Inca Museum downtown. You can also enjoy a stroll up to the old San Blas neighbourhood with narrow paved streets that remind us of the old set up of the city. You have the morning at your leisure. In the afternoon, your expert guide will take you to some of the world’s best archaeological sites in and around the city. Your tour includes sites such as the Cusco Cathedral in the Plaza de Armas and the fabulous Temple of the Sun or Qoricancha, the heart of the Inca Empire. You also visit the spectacular ruins of the Sacsayhuaman fortress that overlook the city, as well as the ruins of Q'enko, Puka Pukara, and Tambomachay nearby. In the late afternoon you return to your hotel in Cusco, and can enjoy the evening enjoying the local cuisine, music, and the splendour of Cusco at night. Today you have the opportunity to check out any restaurants or pick up any last minute souvenirs in Cusco before you continue on your next leg of the journey tomorrow! You have an early transfer to the Cusco airport for your flight to La Paz, Bolivia. Once at the airport in El Alto de la Paz, you need to collect your luggage and our representative meets you to transfer you to your hotel in La Paz (1 hour ride). You have some time to freshen up before you meet your guide in the lobby of the hotel at 2 PM. Your guide takes you to discover the colourful markets, the colonial neighbourhood, and the main square of La Paz, ¨Plaza Murillo.” There is an option to take the highest cable car in the world so you can enjoy magnificent views of the city. 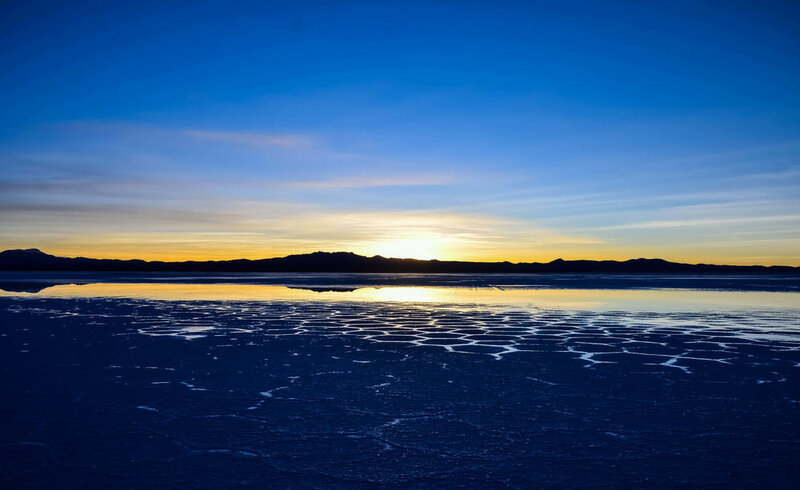 You have another early transfer to Alto de la Paz airport for your flight to Uyuni. Upon arrival to the airport in Uyuni, you are met by your guide and your adventure commences in a 4WD towards the city of Uyuni! You first visit the Train Cemetery on the outskirts of the city. This train graveyard dates back to the early 20th century, and holds trains that were imported from Britain. The salt winds that blow over Uyuni have corroded most of the metal structures, leaving behind a testimony of an era of big plans. A big network of rail lines were supposed to be built out of Uyuni, but the project was abandoned due to a combination of technical issues and tensions with neighbouring countries. After the train graveyard, you continue onwards to the village of San Cristobal. You drive through an arid zone of the Altiplano, and then arrive at The Valley of the Rocks, an extraordinary place where erosion has sculpted shapes on the sandy rocks and soil. Later in the afternoon you arrive at Villamar, a small village where you spend the night in a Refugio (Transfer time 4-5 hours). This morning you drive alongside the Salar de Capina, a large borax reserve. You continue along the dirt road towards the Hot Springs of Polques, where you can enjoy soaking in the hot springs while having outstanding views of Laguna Chalviri. Getting back on our drive, we go through the deserted and isolated regions of Sud Lipez. You get to an area called “Desierto de Dali,” an extraordinary landscape of ochre sand with a few standing rocks that create an astonishing picture. Down the dirt roads further takes you to Laguna Verde where you can see Volcan Licancabur. The journey continues, and you traverse a pass above 16000 ft. before arriving at the geothermal field of Sol de Mañana. After a short tour around the Sulphur springs, you drive towards to one of the most impressive lakes in the area, Laguna Colorada. This lake has a red colored surface and is populated by flocks of flamingos. You have time here to walk around, explore, and take pictures. Finally you end the day at Hotel del Desierto - a unique place situated not far from the Chilean border and at the foot of multi-coloured mountains (Travel time 6-7 hours). After an early and delicious breakfast, you head north of the Sud Lipez region. The road traverses the area Bolivians call “1001 lagoons,” a succession of beautiful lakes of different colours such as Laguna Honda, Laguna Ch’arkota and Laguna Cañapa. You continue towards the volcanoes Ollage and Tomasamil where you have some time to stretch your legs and do a short hike to appreciate the views. Then, you continue along the road to the Salar de Chiguana before arriving to San Pedro de Quemez at the end of the day (Travel time 5-6 hours). Today you make a stop at the Cueva de las Galaxias, a unique cave with amazing limestone formations, before arriving at the Salar de Uyuni. The Salar de Uyuni is the world's largest salt flat at 4,100 square miles. It is between the cities of Potosí and Oruro in southwest Bolivia, and sits on the Altiplano at the foot of the Andes 12,050 ft. high! The most important minerals found in the Salar are halite and gypsum. Some 40,000 years ago, the area was part of Lake Minchin, a prehistoric lake. When the lake dried it left behind two lakes, Popó Lake and Uru Uru Lake, and two major salt deserts, Salar de Coipasa and the larger Uyuni. You have time to explore and hike on the Isla del Pescado (called this due to its fish-like shape). This island is in the middle of the Salar and is covered in giant cacti. Each cactus grows only 1cm per year, which makes some of the cacti on the island over 1000 years old! The Salar seemed to have washed into the island in waves and it is easy to see that this had been an island surrounded by water at one time. You also have nice views of the Volcanoe Tunupa to the west. After lunch, you drive towards Colchani and visit one of the salt extraction areas before going to the airport to take your flight to La Paz. Upon arrival to El Alto de La Paz airport you are transferred to your hotel in downtown in La Paz. Today you visit Bolivia’s most populated city. It’s main attraction is the Witches Market (Mercado de Brujas), located on Calle Jimenez and Linares between Sagarnaga and Santa Cruz. Vendors in the Witches Market sell llama fetuses and dried frogs for Aymara rituals, as well as soapstone figurines and aphrodisiac formulas. After strolling through the market, you are transferred to the airport for your flight home (check-in 3 hours prior to departure). Bilingual Guide (Spanish - English) throughout the trip. All excursions as shown in the itinerary. All transportation as shown in the itinerary combining buses and regular trains.